Nestled in the Madonie mountains, 120 km away from Palermo and 60 km from Enna, the medieval village of Gangi is one of the most important villages in Sicily. 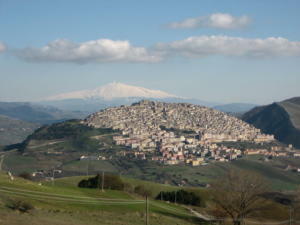 Gangi is part of the circuit of the most beautiful villages in Italy, also named as Borgo dei Borghi in 2014. Gangi is a really relaxing place thanks to its good air, the enchanting view on the valleys, a nice travel destination for its significant main sights and for the quiet that you can feel just walking through its old alleys. A perfect place for your family holidays in Sicily! Go browse now our Family Villas in Sicily selection! The Mother Church of San Nicolò di Bari lies on Gangi’s main street, next to the ancient civic tower of Ventimiglia, which has been transformed into a bell tower. The Church houses an unmissable masterpiece like the Final Judgment by Giuseppe Salerno – second only to the Final Judgment of the Sistine Chapel in Rome -and also several statues by the local sculptor Filippo Quattrocchi. On the lower floor there’s the crypt with remains of priests and a a drying room, where the corpses were left to dry and then treated with wax. This particular procedure, which does not include embalming but the covering of the faces with wax, attracted the attention of the National Geographic that will apparently produce a documentary about this crypt, unique in the world. Another beautiful artwork of Quattrocchi can be found inside the church of Santa Maria del Gesù: this building, with its stunning Romanesque bell tower, houses the sculptures of Madonna with Child and Annunciation. In Gangi you can also visit the 14th century Castle, located on the highest point of Mount Marone, whic was the ancient seat of the county lords, Palazzo Sgadari and Palazzo Bongiorno. If you’re planning to visit Gangi this august, don’t miss the Sagra della Spiga on Sunday 12th, a folkloristic, rural event which has become an unmissable appointment of the entire province. It evokes the old customs, traditions and culture of the rural life of the past, intertwining them with the pagan mythology and in particular with the celebration of the myth of Demeter, goddess of the harvest.